Reviewing The Minoan Coloring Book yesterday, which contains a line drawing of an ancient Minoan octopus jar, I was reminded of this picture that I took in the British Museum. 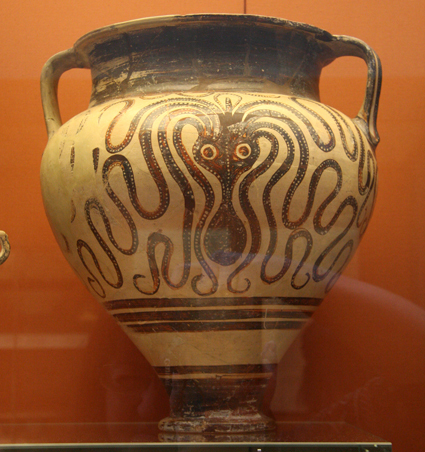 It shows a Mycenaean octopus jar dating from 1300-1400BC that was found at Rhodes. Altough I have always liked this jar, I think the one depicted in The Minoan Coloring Book is more fun - the octopus has such a cheeky expression. I have no idea what either octopus jar originally contained, but I sort of hope it wasn't a real octopus.